Tagging allows you to categorize items for easy tracking and future review. 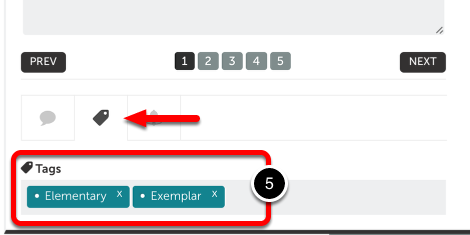 Assessors have the ability to tag whole assessments (performance results and content) and specific content within a student submission (student work only). If you do not see tagging options in your assessment interfance, your system Administrator has disabled the feature. Please proceed to the Save Assessment help page. 1. Locate the submitted content that you would like to tag, and click on its Tools icon. 3. Begin typing in the text-entry box to enter your desired tags. As you type, matches in the system will appear for you to select. If no matching tags appear, hit "enter" on your keyboard to create a new tag. 5. Begin typing in the text-entry box to enter your desired tags. As you type, matches in the system will appear for you to select. If no matching tags appear, hit "enter" on your keyboard to create a new tag.